Addison is one of five owners at Seduction. Since they opened six months ago, their restaurant has been gaining in popularity. To help bring in even more customers they decide to hire a musician to come and play on the weekends. They had no idea that a former rock god would walk into their front door looking for a job. 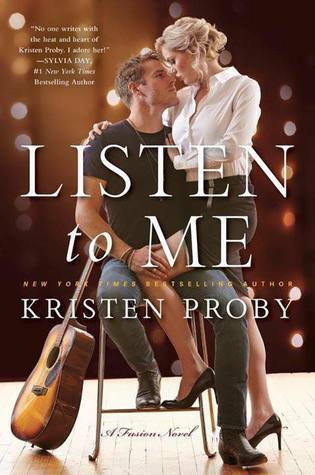 He’s set his sights on Addison and isn’t pulling any punches, but she’s been burned one too many times by musicians and she’s not about to go down that road again. I was really excited to read Listen to Me. It has everything that I love in a good romance. It’s got a successful woman, humor, a celebrity, and of course romance. However, this story just lacked depth. You read about all these people but they were just background noise. I could never remember her friends/co-owners names or who they were. Plus, I found the romance to be really cheesy. I mean, Jake walks into Seduction to apply for a job and once he’s given a date for an audition he immediately starts hitting on Addison. There were even moments where he told one of her friends that she had really beautiful hair and the internal dialogue goes on to say how he wasn’t hitting on her, he’s just nice to everyone. What?! It’s not that Jake was a sleeze-ball or anything but the characters just lacked so much depth and development that everything, even the voice for the whole book was pretty monotone. I really thought I’ve love this one but it just wasn’t for me in the end. Thanks for saving me from this! I can’t do stories with no depth. I probably would have dnf’d it. Aw that’s too bad. I’d heard some good things about it :/ Bummer when it just doesn’t work for ya.